Vicki Swan and Jonny Dyer pay a second visit. A young duo whose musical talents are well honed. 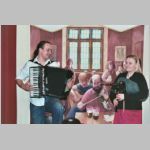 Vicki plays Scottish smallpipes, flute and Swedish nyckelharpa while Jonny plays guitar and accordion. If you’re greedy for more they also sing in harmony.